Different students attending the same lessons will have very different results. This fact has struck me throughout my career as a French teacher and now a French learning coach. For this reason, an important part of my work as a coach is to give simple and actionable advice to my students, so that they can get the best possible results for their time and effort. Here are 8 tips that I give to all my students. Applying any of these tips will make a big difference in your study. If you apply all of them, you will be amazed at how fast you learn. Many people what to learn French. Sadly, "learn French" is not an actionable goal. The French language is made of over 100 000 words, countless grammar rules and many different local variants. Clearly, you don't want to learn all of that. It's not just daunting, it's impossible. I'm a French learning expert and I don't know all of that. Nor do I need to. You want to learn some French. The distinction is very important. Do you know that you could live in France without problems, knowing only 1000 words (that's about 1% of the total). Suddenly it sounds much more doable. Here is the catch: the French you want to learn is not the same as another person's French. Of course there is some overlap, which is why it's so easy to take any beginner course and learn the basics. However, once you've done that, you quickly find yourself limited to very basic interactions. Sometimes, you get the feeling that you speak French like a 5 year-old, which is very uncomfortable. - If your spouse and in-laws are French speakers, then you'll want to focus on speaking about your family and everyday life. - On the contrary, if you work in an international company and you need to communicate with French speaking colleagues, then you'll need a completely different set of words and behaviors. Whenever I work with a new student, defining and refining their goals is the first thing we do. We want to get cristal clear on where they want to go. Then it becomes so easy to get there in the fastest way. Of course, once you have your goals well defined, make sure to share them with your teacher or tutor. If you join a group class, make sure it aligns with your goals. You will save so much time and headache this way. By the way, if you would like me to do this with you, you can find more information about working with me here. Once you know your goals, it should be easier to feel committed to your study. The challenge is to stay committed over time. Learning French is a marathon, not a sprint. Make room in your calendar for your sessions. If you've signed up for a group class, make it a non-negotiable appointment. If you take one-on-one lessons, try to stick to a set day and time, every week. Book several lessons in advance to trigger the "sunk cost bias" (we hate not showing up for what we've already paid for). Remember, half of the work is just showing up. The main reason why people fail at learning French is because they either study very rarely or quit altogether. Already committed to one or two lessons a week? Now, up it a notch with a small daily practice. - A quick vocabulary review (5 minutes). Even better if you do it every morning and every evening. - Watch a video or listen to a podcast in French. Whenever I get a new student, I always supply them with a list of resources, including French YouTube channels that suit their personal interests. (This is a standard part of Your Roadmap to Fluency). Their mission is to watch some of these videos everyday. Taking this "daily French bath" is an excellent way to train your brain to accept the language as a part of your reality and to start understanding more and more. Why do people fail at learning French? Because they quit. And why do they quit? Because they loose motivation. - Make a list of all the things you'll be able to do when you finally speak French (your goals identified in #1 should help with that) and read it whenever you need a motivation boost. You can even stick it to your fridge or any place where you'll see it often, this way you will read over it even if you don't actively try to. - Sign up for my free email newsletter. 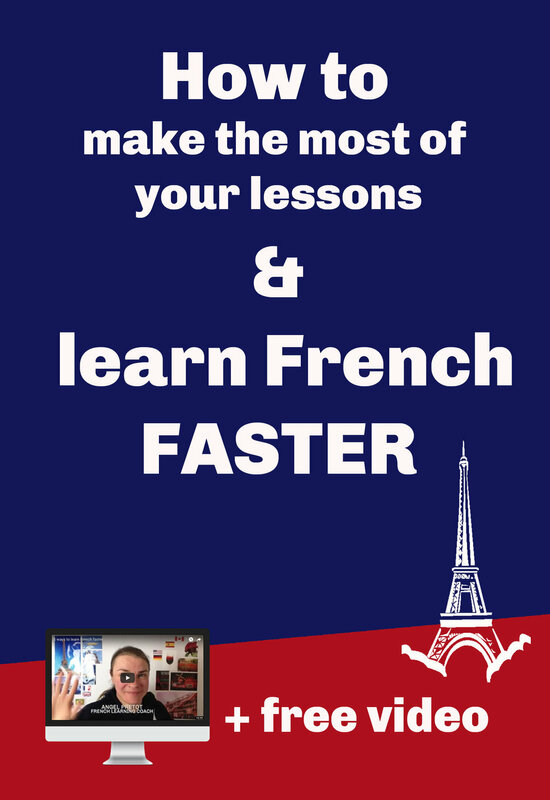 I'll will send you French learning tips and inspiration every Monday. Many readers have told me that it's a great way to stay motivated and inspired. Besides, as soon as you sign up, you'll get a special 15-minute video with my 5 best French tips. This is a must for all my students. Throughout the week (or however long you have between two sessions), write down any question that comes to your mind. Then, bring you list of questions to your next session and ask away. There is something weird I noticed: after one or two questions, students tend to apologize for having so many questions to ask me. Newsflash: your teacher or coach has to answer your questions, it's literally what you are paying them for. 2) The student receives answers to all their questions. In the rare case when they'd ask a question that I can't answer straight away, I will do the necessary research and send the answer per email after the session. These questions are my favorite, since they are what helps me learn and grow as a coach. If you have a question, then it means that you are ready to progress in some specific direction. The answer is what you need to progress. So, never leave a session with an open question. You learn French by making the language a part of your life. It cannot stay confined in the French classroom or in your online sessions. Ultimately, you want to be able to speak French in real life, right? So, start now, with any French skills you have, no matter how small they may be. Nowadays, the opportunities to practice are limitless, you can take a trip to a French speaking area, attend an event with French speakers, get a language partner (online or in real life), use an app like Hellotalk for a quick chat, etc. There's nothing like a well crafted plan to get you the results you want. For years as a French teacher and coach, I wished there would be a tool that gives my student a direction, so we easily know what to study next and how. The challenge was that such a tool would need to be personalised for every student, since everyone is different and has different goals (see #1 in this article), hence why such a tool didn't exist. Then I created Your Roadmap to Fluency. Following a simple process, I can understand the student's learning style, their goals and possible roadblocks. Then, I create a personal learning plan for them. This plan is called Your Roadmap to Fluency. Once you have it, you can choose to keep studying with me, following the plan as we go, or to follow the plan on your own, as long as you have someone with whom you can practice French. I accept new students and create new Roadmaps for them a few times per year. You can find more information about it right here. I hope you found those 8 tips helpful. If you did, please share this article with your friends.